ANNAPOLIS – The pilgrim statue of the “Homeless Jesus” found his last shelter of 2017 at St. Andrew by the Bay in Annapolis Dec. 1. A lightweight, resin replica of the statue, which was created by Canadian sculptor Timothy Schmalz, has traveled around the Archdiocese of Baltimore since February, and it will remain at St. Andrew’s until Jan. 2. The work depicts a full-size barefoot Jesus sleeping on a park bench, covered with a blanket down to his ankles. His head almost completed hooded, showing only his crown of thorns, and naked pierced feet displaying his sacred wounds. The statue was strategically placed immediately inside the church sanctuary, in between the two main entrance doors, making it impossible to ignore. The parishioners’ reaction to the art work was immediate. Father Dauses said that young children were particularly fascinated by the artwork. “When their parents would point out the wounds in the feet of the statue, and the children realized it was Jesus, there was almost this audible gasp,” he noted. 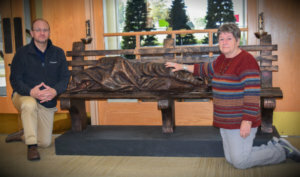 Father Dauses hopes that the statue will bring more awareness among his parishioners to their support of the Winter Relief Emergency Shelter Program, an Arundel House of Hope outreach that will have St. Andrew by the Bay provide overnight shelter Dec. 26-Jan. 2 for approximately 35 men who are homeless. An ecumenical program based in Glen Burnie, the Winter Relief Program involves 72 churches in Anne Arundel County to provide food, clothing, shelter and comfort during the winter months to to men and women who are homeless. Parishioner Marge Tsitouris is the head volunteer coordinator for the Winter Relief Program at St. Andrew by the Bay. A retired social worker, Tsitouris said it takes close to 170 volunteers to host the guests for a week at the parish. In addition to shelter, guests at St. Andrew by the Bay will enjoy all home-cooked meals, transportation and a variety of activities, such as bingo, entertainment and free haircuts. Volunteers will also do laundry for them. 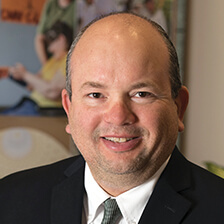 “They (guests) have an opportunity to relax, if only for a week, which is something they can’t do when they are out in the streets,” Tsitouris said. Father Dauses said the Homeless Jesus statue helps brings the Gospel to life. There are plans for a bronze version of the statue to be on permanent display in early 2018 at St. Vincent de Paul Church in Baltimore. The parish is known for its outreach to the homeless. A lighter weight, temporary version of “The Homeless Jesus” has been hosted by 28 parishes and schools in the Archdiocese of Baltimore this year.